The following extract from the July Christadelphian magazine illustrates that Christadelphians are continuing their work to impose their religious beliefs on innocent young minds at school. "Our purpose is not just to educate students for life, but to INDELIBLY EDUCATE THEM FOR EVER." In our opinion, "Indelible Education" is an evil tool of Nazis, Communists and North Korean Dictators. People who want to "Indelibly Educate" children seek to impose their propaganda and political and religious thinking onto kids by a process of conditioning and brainwashing at a young age. It should be resisted by all right thinking people who want to defend the human rights of children and the decency of society. 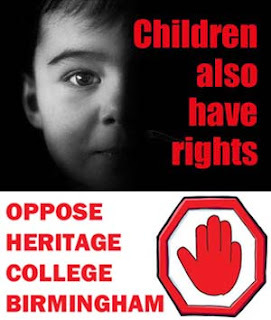 The last phrase shows that genuine school education is merely an afterthought in the proposal to establish a Heritage College school in Birmingham. You can be sure that when the Christadelphians submit their paperwork to the authorities to apply for permission to open their school they WILL NOT DARE inform them that preaching Christadelphian dogma to the children and parents of unsuspecting non-Christadelphians is one of the prime purposes of the school - as revealed above. We Ex-Christadelphians know what it's like to be indoctrinated in to the Christadelphians religion and we don't want other kids to suffer the same misfortune. It took us years to escape from that cult-like mental jail. We appeal for activists in the Birmingham area of the UK to contact us so that we can mobilise effective opposition and protest against this project to preach the Christadelphian version of the gospel to impressionable young minds. See our special feature on Christadelphian Heritage Colleges for more: Click here.